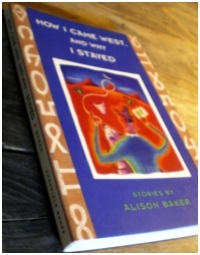 New review for “Rediscovered Reading” at Fictionaut Blog, How I Came West and Why I Stayed by Alison Baker. The idea of the tall tale is to make the listener believe what they are hearing and then at some point to break the frame and say something like “Gotcha.” Although I suppose in a masterly tall tale, the author or storyteller may never let you know. Although they have a lot in common with myths, tale tales I think have less to do with allegories and more to do with surface of the story and the confusion of reality.